Early this morning I popped in the car and, managing to skirt around the very impressive Remembrance Sunday crowds and consequent road closures, I headed to Tate Britain. Comfy clothes and comfy shoes (sorry but even I’m not that committed to my heels) were the order of the day for a weekend gallery outing. 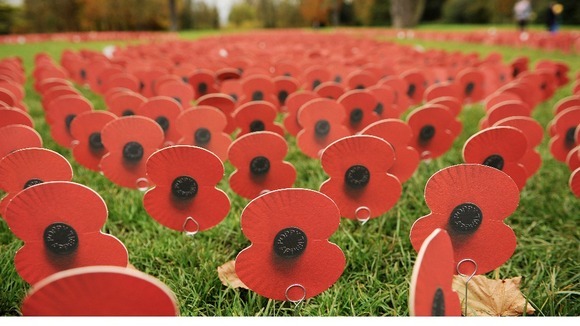 Remembrance Day services. Image via www.itv.com. I’m not a huge Turner Prize fan but it’s still nice to have it back in London (last year it was in Gateshead marking the start of its biennial staging away from Tate Britain). The Turner Prize takes over the downstairs space at Tate Britain but is hung differently to usual with the entrance being where we used to find the exit. This seems to work much better though I can’t quite fathom why. Unusually, all of the shortlisted exhibitions that led to these nominations have taken place in Britain so many of you may well have seen the works before. To start, we are greeted by Paul Noble’s drawings. 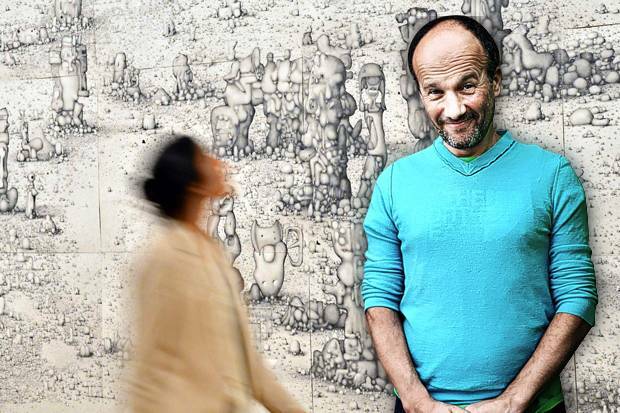 I blogged his exhibition at Gagosian earlier this year, where we saw his sprawling drawings detailing the minutiae of Nobson Newtown. I’m a fan! But, the exhibition at Gagosian was far better and maybe this is a larger problem with the Turner Prize – it fundamentally reproduces shows from the last year but diminishes them so they aren’t normally as good. For me, the marble sculptures are slightly too crude and provide an unwelcome distraction from the densely fabulous pencil drawings. Nobson Newtown at Tate Britain. Image via www.standard.co.uk. Luke Fowler’s film is a full-length documentary but I did not have 93 minutes to spare this morning. Whether or not I will return to watch in full remains to be seen. 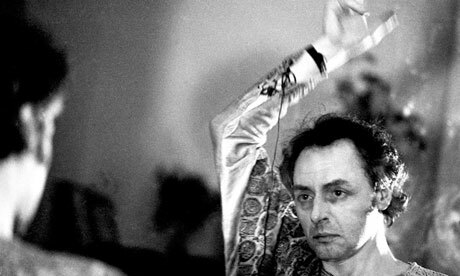 The film is about RD Laing and the anti-psychiatry movement but, unlike a normal film, it does not have a narrative. Instead, it is a collage of short scenes and snapshots that come together to tell its strange story. 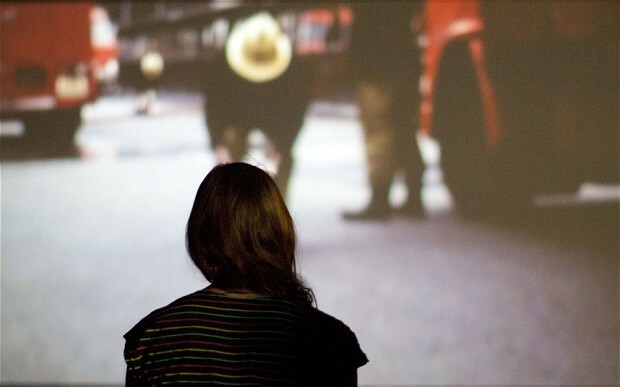 Is this art that is film or a film masquerading as art? Still from Luke Fowler’s All Divided Selves. Image via www.guardian.co.uk. I wasn’t able to watch Elizabeth’s Price video work as there was a technical fault this morning but, from what I understand, The Woolworths Choir of 1979 is an overpowering piece in three acts, bringing together old photographs, archive footage, rhythms, words and sound. The piece is an act of commemoration, exploring the horror of the fire in the Manchester branch of Woolworths. Elizabeth Price, The Woolworths Choir of 1979. Image via www.telegraph.co.uk. Finally, we reach Spartacus Chetwynd’s work but I wasn’t around at the correct time to see one of the actual performances. Chetwynd’s work seems intended to shock; Tate describes her team as an energetic “16th-century wandering troupe”. What makes her work stand out, despite its silliness, is that Chetwynd’s commitment to her absurdity is entirely sincere – a contradiction in terms perhaps but one with often spectacular results. I never made it to her 2011 Sadie Coles show but have heard it was far more dramatic, exciting and fun. These feelings are nowhere to be found at Tate. 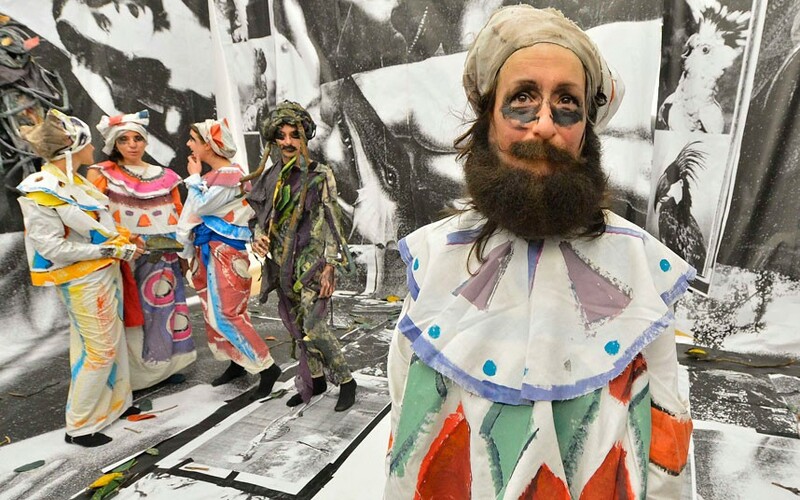 Spartacus Chetwynd with co-performers as part of Odd Man Out 2011. Image via www.telegraph.co.uk. Tate has gone for non-traditional media this year. I’d like Noble to win but I imagine one of the video artists will take the prize. Although I walked around the whole exhibition, I left feeling I had seen very little of the Turner Prize and didn’t really know what to make of this year’s submissions. The winner of the prize will be announced live by Jude Law(!) at the award ceremony on Monday 3rd December 2012. I worry that Tate may be going too far to popularise the Turner. Before long the artists will have to do live tricks on air to cement their win. 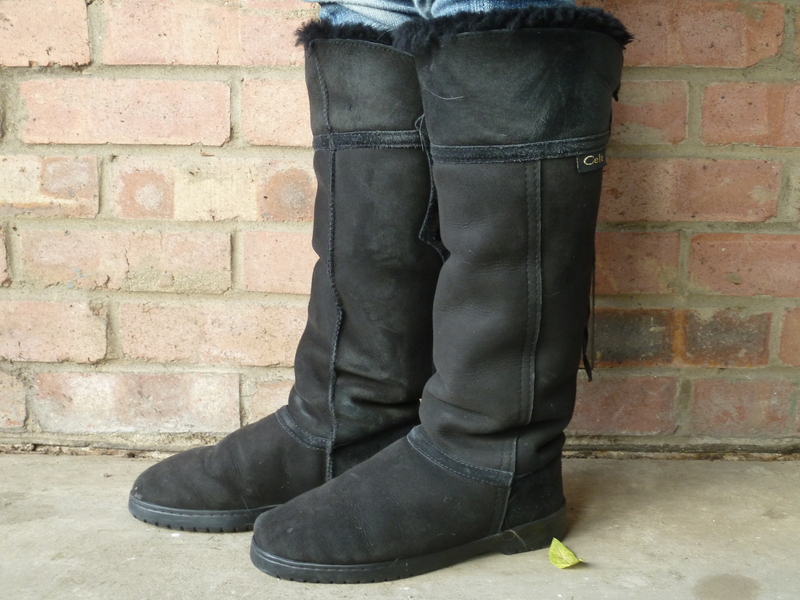 Elizabeth Price – not working. Own photograph. 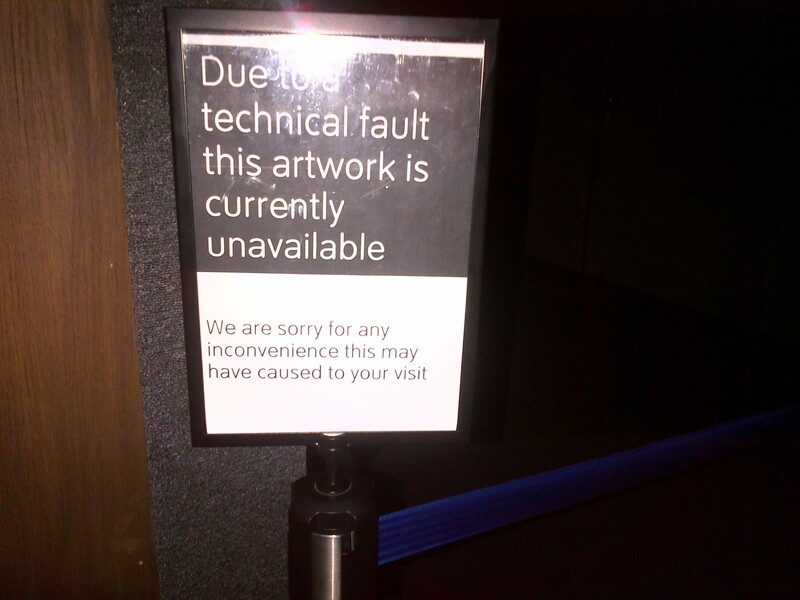 The main reason for today’s visit though was to see Tate’s Pre-Raphaelite exhibition. By 10.30am it was already packed out although the guard told me that what I thought was busy was in fact quiet. As snobby as this will sound, I do find it hard to enjoy exhibitions that are flooded with people. I began to regret not wearing sharp stilettos that would have helped me to encourage people to move out the way (don’t worry, I’m only joking). Luckily, I was very familiar with most of the works here so didn’t feel I was missing out when I couldn’t get near to them. 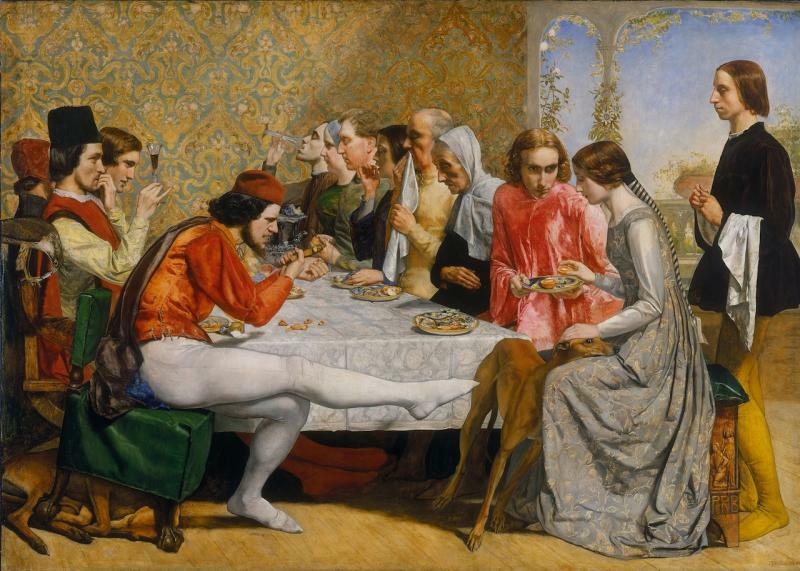 Walking through the seven rooms, was like reliving my Courtauld first year survey course with Holman Hunt’s The Hireling Shepherd, Ford Maddox Brown’s An English Autumn Afternoon, Hampstead – Scenery in 1853, Millais’ Christ in the House of his Parents and many more besides. 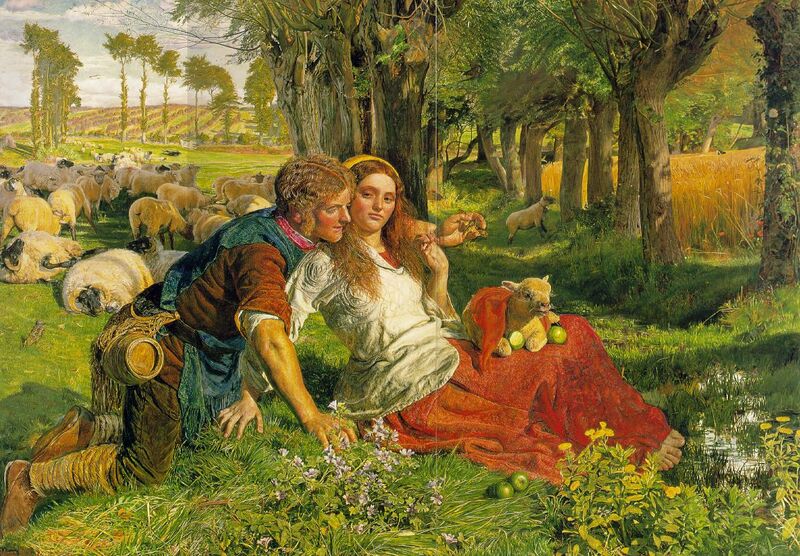 William Holman Hunt, The Hireling Shepherd, 1851-2. Image via www.artchive.com. Visitors to the show are heading straight to the work hanging opposite the entrance – Millais’ Isabella that created rather a buzz in the press before the opening. One of the curators spotted that the foremost figure has a large erection. He leans forward, with his leg stretched out in front of him and, although his groin is covered, a shadow is cast on the table. It’s unmissable, yet we have missed it since 1848 when the work was conceived. John Everett Millais, Isabella, 1848-9. Image via www.theartsdesk.com. The Pre-Raphaelites’ recognition of women as sensual and sexual people is obvious and one of their defining features. Desire pours forth and we know that many of these artists were enjoying themselves and their models. We can feel the curators’ passion as we walk around the show. With 180 works, they’ve certainly tried to cram in all their favourites (although a few notable works are missing). Now, the Pre-Raphaelites may not be to everyone’s fancy and I have heard some describe their work in horribly derogatory terms. But, whatever you may think, all opinions are subjective and however ‘bad’ some of the works are it’s important to remember that everyone has different tastes. As such, the popularity of this period reigns supreme and there are some fabulous works included here. 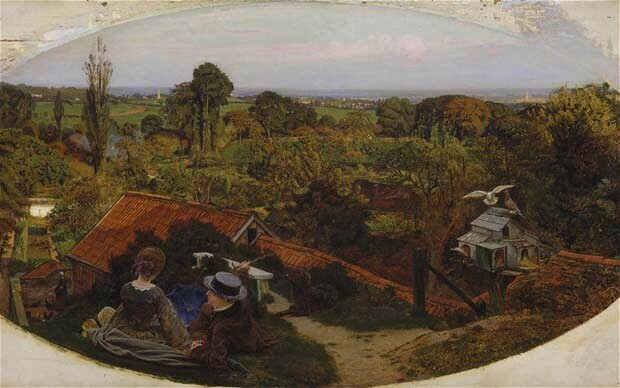 Ford Madox Brown, An English Autumn Afternoon, Hampstead – Scenery in 1853,1852-3. Image via www.telegraph.co.uk. Many of the works do merge into one – partly because the Pre-Raphs often painted with a prescribed artistic formula and relied on this through and through. The works don’t often take too long to look at, they initially captivate with their bright and bubbly colours but their joy can fade away quickly when we start to note their cramped scenes, sickly colours and lack of perspectival understanding. 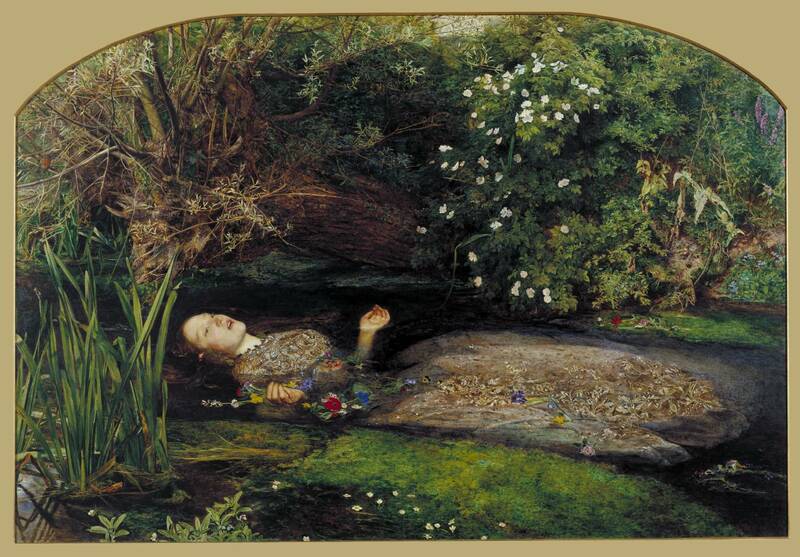 Some of the works are moving and many, like Ophelia, are so familiar that they are part of our everyday life. John Everett Millais, Ophelia, 1851-2. Image via www.tate.org.uk. I don’t think the exhibition has managed to prove anything new academically and, in fact, I disagree with the arguments that encourage us to view the movement through the eyes of Modernism but it’s a beautiful exhibition, presenting a well-known story and some well-known paintings alongside a mix of Victorian works. Although it is a neatly summarised show, this is also its main problem. Chronology has been abandoned here and themes imposed on the work often lead to confusion rather than distinction, such as Salvation, Beauty, Mythologies and History. This does make it difficult to follow the progression of individuals as they get lost in the melée. The exhibition doesn’t end on a bang and the last two rooms lose something for me – perhaps because this is actually no longer Pre-Raphaelitism but Arts and Crafts. They clearly intend to show the influence of the Pre-Raphaelites on the later movement of Arts and Crafts but Tate fail to separate the two. 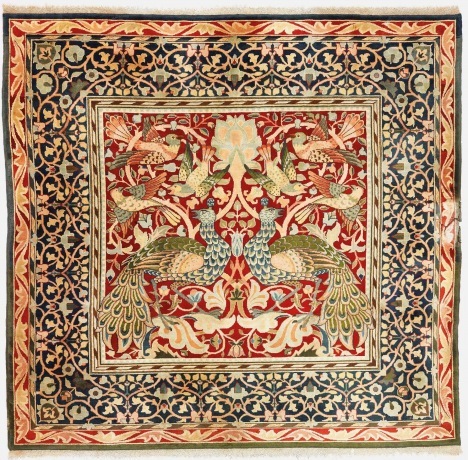 William Morris, Peacock and Bird Carpet, 1885-90. Image via www.tate.org.uk. I certainly don’t loathe this period. In fact, I rather enjoyed the exhibition and, although there are a lot of works shoved in this space, I do think it’s a very well-curated show with great wall colours and good lighting (something I don’t often say about Tate). 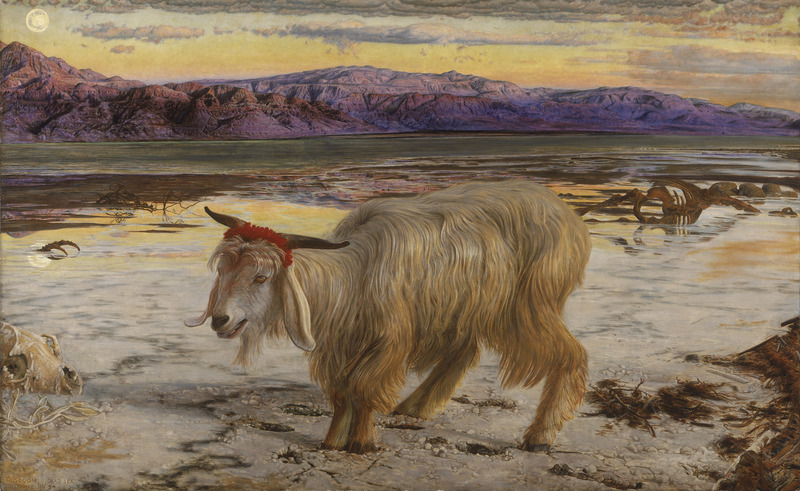 William Holman Hunt, The Scapegoat, 1854-6. Image via www.wikipedia.org. The curators have taken care to stress the female artists from the circle with Julia Margaret Cameron and Elizabeth Siddal making bold appearances. This is a very British show and we’ve had a very British year so Tate could not have timed this better. One thing that still upsets me is the lack of an artist-designed Christmas tree at Tate. Although the rotunda is no longer visible due to the major building work currently in progress I fail to believe that there is no room anywhere in the gallery to have kept this tradition alive. The rest of London once again embraces Christmas while Tate stays in the dark. Turner Prize 2012 is at Tate Britain until 6th January 2013 and Pre-Raphaelites: Victorian Avant-Garde is at Tate Britain until 13th January 2013, www.tate.org.uk.